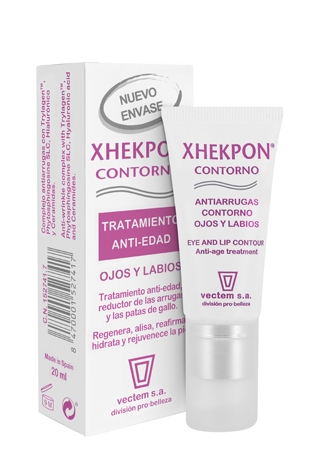 XHEKPON CONTOUR , vectem s.a.
Multi-active, anti-wrinkle complex for intensive care of eye and lip contour skin. Trilagen™ - Triple action: increases skin collagen synthesis, improving its skin structuring capacity and slowing its degradation and loss. Phytosphingosine SLC – stimulates regeneration of the dermal-epidermal layer, improving the junction and interaction between dermis and epidermis, with anti-wrinkle effect. Hyaluronic Acid – great natural moisturiser. Plumps and smoothes deep wrinkles. Ceramides, oil rich in linoleic acid, Karité butter, PCA, ... maintain skin barrier function, defences and hydration.